Farmersgirl Kitchen: Hotel Chocolat Eggstaordinary Giveaway! THIS GIVEAWAY IS NOW CLOSED - THANK YOU. This time last year, I entered a blog giveaway at Jam and Clotted Cream and won a delicious Easter Egg from Hotel Chocolat. I was thrilled to win the chocolate egg, you can read about it HERE, but am even more excited this year because I have been given this Hotel Chocolat Easter Eggspose Egg to review and YOU can enter my giveaway to win this gorgeous Easter Eggspose egg from Hotel Chocolat - result! 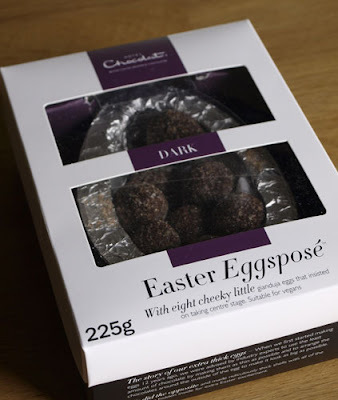 I've had a little nibble at the Easter Eggspose egg, the dark chocolate is so rich and smooth, something to be savoured with a nice cup of coffee or a glass of red wine. The 'eight cheeky little gianduja eggs' have a crispy chocolate outer shell and soft truffly stuff inside, a real treat. So how can you win one of these Easter Eggspose eggs yourself? 1.Give your name and answer the following question in the COMMENTS section below: Why would you like to win an Easter Eggspose Dark Chocolate Easter Egg? Tweet the sentence below and then tell me in COMMENTS section below you have done so. Please make sure you copy the whole sentence in the inverted commas. The winner is randomly chosen by the Random website. Unfortunately, due to the nature of this prize this giveaway is only open to UK residents. PS. If you have any trouble signing up for this competition, please contact me. I'd love to win this Easter Eggspose egg because my neighbour is getting much too thin and it would be churlish not to share - or would it? It looks absolutely gorgeous and many thanks for giving us the chance to try it. I'd love to win this Eggspose egg as it sounds 'eggstroadinarily' fabulous and I'd like to have a 'crack' at devouring the whole lot. I would love to win this Eggspose egg and share with my dark chocolate loving family! I'd love to win because I love chocolate, I love Easter eggs and... did I say I love chocolate? I'd love to win this Easter Eggsponse Egg because I haven't had an Easter egg in over 6 years ! Plus I'm sure winning this egg-cellent prize would make it taste ten times better :) Not to mention it looks like serious quality chocolate *wipes away drool* Mmmmm ! Who could resist the chance to win something filled with "truffly stuff" (egg-cellent phrase there, hinny!). Please put my name in the egg box! Well I'd like to have it Janice if only to save you from yourself... I mean to eat all of it would be bad for you... Plus the Easter Bunny doesn't appear to know where I live! I'd like to win it because it's chocolate!!! Louise. I would love to win to surprise my husband who is a dark chocolate loving nut! I would love to win Easter egg, not only because I am a big fan of dark chocolate, but also because this custom of giving chocolate eggs is not very popular in Poland and still quite new to me, even I have nbeen here for few years. :) Neve bought one, as those I have seen were milk chocolate, I would love to try one, goodquality, dark chocolate. I would LOVE to win this fab Easter Eggspose egg because I would love to be able to give it to my dad. He loves dark chocolate, and has been sucha a help recently with my decorating and gardening, so he REALLY deserves a little treat! I'd love to win this for my mum - she adores dark chocolate and I don't think she's ever tasted anything from Hotel Chocolat before. Have tweeted - for my mum to win it! I would love to win because its looks delicious chocolate! i would love to win this, as i love Hotel Chocolat and one of those eggs will be many times nicer than lots of the chaper ones. wow what an eggcellent prize! I would love to win as i've never tasted Hotel Chocolate before. My children would love me to win the fabulous Eggspose Dark Chocolate Easter Egg so we can give it a "crackingly" good, albeit short, seaside holiday in beautiful sunny St Ives Cornwall before they unashamedly eat every last morsel, until there is no trace left! My children would love me to win the fabulous Eggspose Dark Chocolate Easter Egg so we can give it a "crackingly" good, albeit short, seaside holiday in beautiful sunny St Ives Cornwall before they eat every last morsel, until there is no trace left! RT sentence has been posted as requested on Twitter! I'd love to win this because I love chocolate! Why else would I want to win?! I would love to win because I've never had such a delicious looking easter egg! i'd love to win this easter egg as its made of chocolate! simple! As I've given up chocolate for jus for Lent. After 40 days I'll be a shivering mees. An egg like that I wouldnt want any less. I want to win one because I have given up bread for lent so I can still have chocolate! hurrah! I would love to win the easteregg as i would share it with my mum who has done so much for me while i struggle with a long term illness. I'd love to win this Easter Eggspose Easter Egg beacuse I have given up chocolate for Lent and this egg would be the perfect way to reintroduce myself to the pleasures of chocolate on Easter Sunday :) It's going to be a long 40 days! I'd love to win - it looks divine. I would love Easter Eggspose Dark Chocolate Easter Egg as I'm a chocoholic, and hotel chocolat's chocolate is the best. I would love to win as I adore dark chocolate the darker the better mmmmm. "I want to win a Hotel Chocolat Easter Egg from @serialcrafter. Click here, http://farmersgirl.blogspot.com"
well, that's a very silly question. doesn't everyone love choccie?? I'd love to win this Easter Eggspose egg because it looks so yummy and chocolatey! It's rich, dark, velvety, exquisite taste, would send my tastebuds high. I would love to win the egg because currently im trying to cutt down on my dairy intake and that is hard! This dark chocolate one would at least have less dairy in it which means id be able to have a treat this easter and not be left out! Hi, I'd love to win this as my children eat all my chocolate ! I'd like to win Easter Eggspose Dark Chocolate Easter Egg because my husband doesn't like dark chocolate so I could eat it all to myself! And I'd like to win this Eggspose egg as Eggspose is very close to Eggspouse and I'm getting married this year and it would make a fantastic present for my fiance! I love chocolate so much i think i may be made of chocolate! I would love to win this egg to remind everyone that Easter eggs aren't just for kids, I will start a campaign to get everyone to buy chocolate eggs for the grown ups too! Managed to resist buying any this year so far*, if i could win this i wouldn`t need to bother going to Tesco! RT'd on Twitter as well, thank u! I would love to win this egg because I love chocolate - and Hotel Chocolate are the finest chocolatiers! I would have to eat it in secret though, as my two children have inherited my love of all things chocolatey!